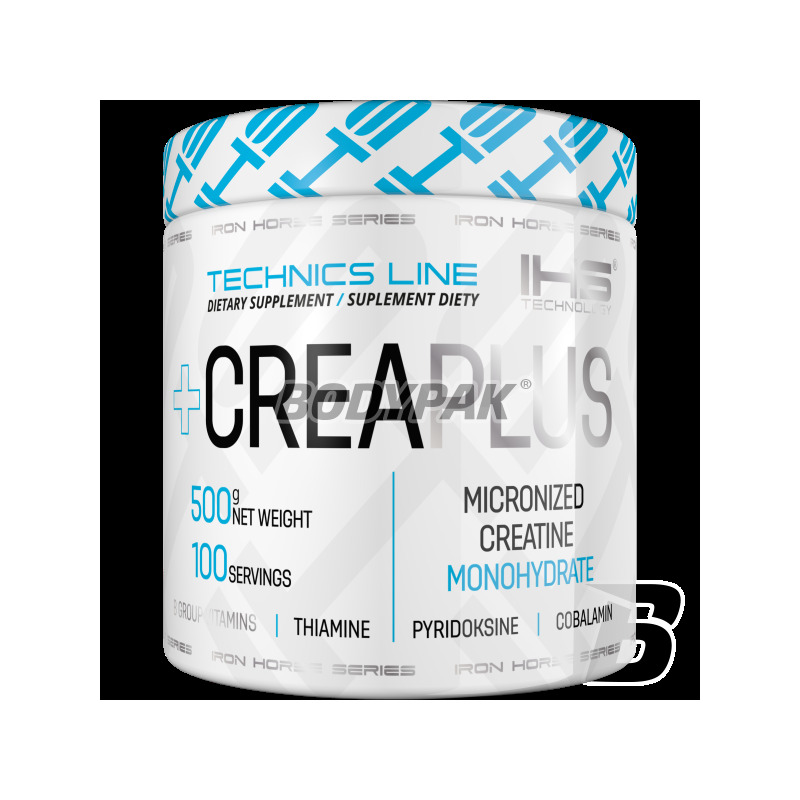 Creatine supplement based on the highest quality creatine monohydrate, sodium and vitamin C to ensure maximum growth of muscle mass and strength. The force of anabolic. Invest in yourself today! The product is intended for professional athletes and amateurs practicing discipline, strength, strength-endurance, speed and. The product has been enhanced with taurine and a set of vitamins that support the proper functioning of the body! 118 loyalty points Your cart will total 118 points that can be converted into a voucher of 4,72 PLN. Creatine is known and used already for over 20 years! There is no commercially effective anabolic substance, which is not vitiated by side effects. In all these years conducted research award for its effectiveness and safety of supplementation - does not demonstrate any adverse health effects. Improve your gains in lean muscle mass and strength! Effective and safe - creatine perfect? In a sense, yes - proven by many athletes! 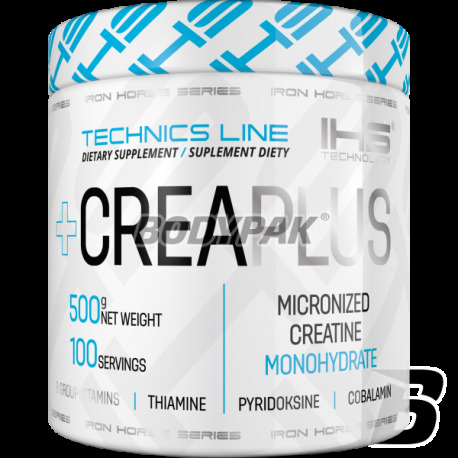 IRON HORSE SERIES CREA PLUS is a product designed for competitive athletes and amateurs practicing discipline, strength, strength-endurance, speed and. The product has been enriched with one of the amino acids L-Taurine. Creatine improves the strength of muscle contraction, which is associated with an accelerated re-synthesis of ATP. It also exhibits anti-catabolic effect, reduces the acidification of muscles and improves nitrogen balance. L-Taurine helps transport of creatine due to its action of insulin-mimetycznemu. This is because it stimulates the pancreas to burst of insulin, which has the ability to transport nutrients, including creatine, glucose, amino acids into the muscle cells. It also regulates blood pH, which decrease as a result of intense exercise can significantly worsen exercise capacity. L-Taurine reduces catabolism and exercise can significantly improve the strength - inhibits the production of serotonin, which is responsible for our fatigue. IRON HORSE SERIES CREA PLUS PRDUKTEM IS THAT MAKE EVERY CYCLE WILL BE EXTREMELY SUCCESSFUL! Use 2 times a day 5g of the product (in the morning and after training). Use 1 serving a day - 5g of the product. Component: creatine monohydrate, taurine, magnesium, thiamine, pyridoxine, cobalamin. To jest ulubiona kreatyna mojej żonki. Przekonała mnie i od jakiegoś tygodnia stosuję. To, co mogę już powiedzieć, to, że jestem zaskoczony jak dobrze się czuje po tym suplemencie. Świetna pompa, mega siła. Tylko nie polecam brać rano – mam to za sobą i wiadomo, kreatynę lepiej potem ładować. Najlepszy wybór na pierwszy cykl kreatynowy. Dużo wysokiej jakości krety w porcji + dodatki, ale z wyczuciem. Na płaskiej poszło mi +12 kg na stronę na sile. Dobre nawodnienie komórek mięśniowych. Tak więc gorąco polecam Crea Plus z IHS! Duże pakowanie wystarczy na średniej długości cykl. bardzo fajny towar. The long-awaited product finally available! Excellent creatine malate in an easily absorbable powder. Improve your results thanks to the creatine!